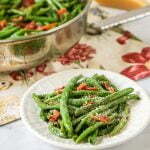 These low carb green beans & bacon are a staple in our household. This is a delicious recipe to keep in mind when those fresh green beans from the garden start rolling in. Best of all it only takes 15 minutes to make! Add your 4 pieces of bacon to a large saute pan and cook. Meanwhile cook the clean green beans in the microwave for 4 minutes. Once the bacon is done, take out of the pan and add in the green beans. Cook the green beans for 5 minutes or so until they start to brown and wilt. Crumble the bacon and back to the pan and mix in. Sprinkle fresh grated Parmesan cheese on top and serve.